Buy an Irwin 1/4" or 6mm bolt extractor thinking you'll need it. I needed to get a rotor off of a 91 K1 final drive. Thinking one or both of the rotor bolt heads would surely strip I bought the bolt extractor ahead of time. After heating the bolts with a little butane torch both came out with relative ease using the factory toolkit Allen wrench. Ain't it nice when that red Loctite lets go with a little heat? These bolts came out pretty clean with respect to there being thread locker on them. I've seen a local indy mechanic heat them up with an oxy-acetylene torch and still have problems. When I install them I always use plenty of anti-seize and minimal torque. On a '93 K1100RS final drive I needed to change the disc so I used a propane torch and still the heads were 'buttery' and threatening to strip. I grabbed my handy hand-held impact hammer and they both slowly unwound after a good pounding into submission. Damn that unnecessary factory thread locker! I bought a new rear rotor for the K1100. I have one bolt opening and when I get the other off the new ones are only going in hand tight and no Loctite. My car only had one bolt to hold discs in and the bolt is only used to stop the disc falling out when you take off the wheel. The wheel bolts are what keep the disc in place. Now getting the ABS rail off is a different matter. Olaf, you might like to try my technique for getting out those button head allen screws that retain the ABS ring. First up get a cheap sacrificial allen key of the right size and check that your tool kit allen key is nice and square on the end you are going to use. Get your gas bottle heating torch at the ready. 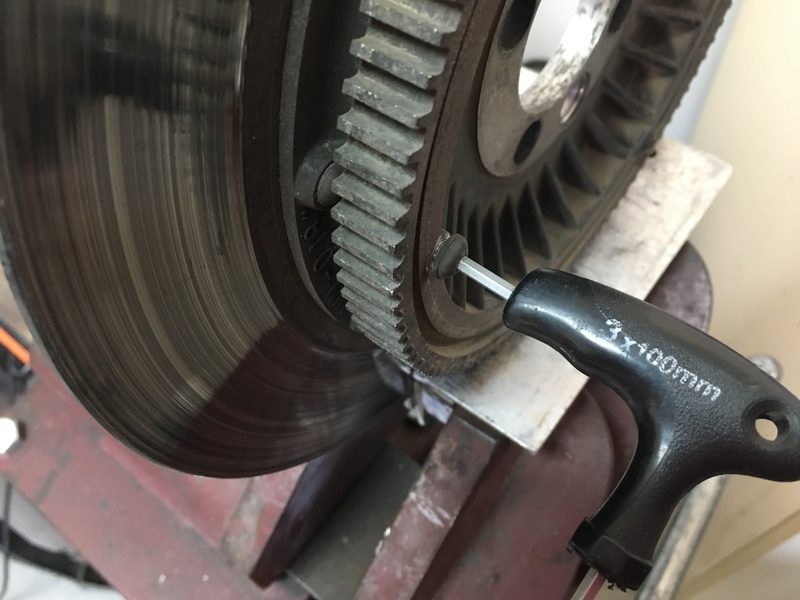 Clamp your disk/wheel firmly somehow and then put the sacrificial key into the screw head and heat the key up to red hot a little away from the screw and hold it red for 30 seconds or so as in the picture below. Grab your pliers and whip out the hot key and throw it onto the concrete or somewhere it won't start a fire then place your good key into the bolt head, give a light tap to make sure it is seated properly and remove the screw. Works for me. Good luck! I always feel quite nervous about applying high heat direct to a bolt because of the possible collateral damage in the surrounding heat affected zone. 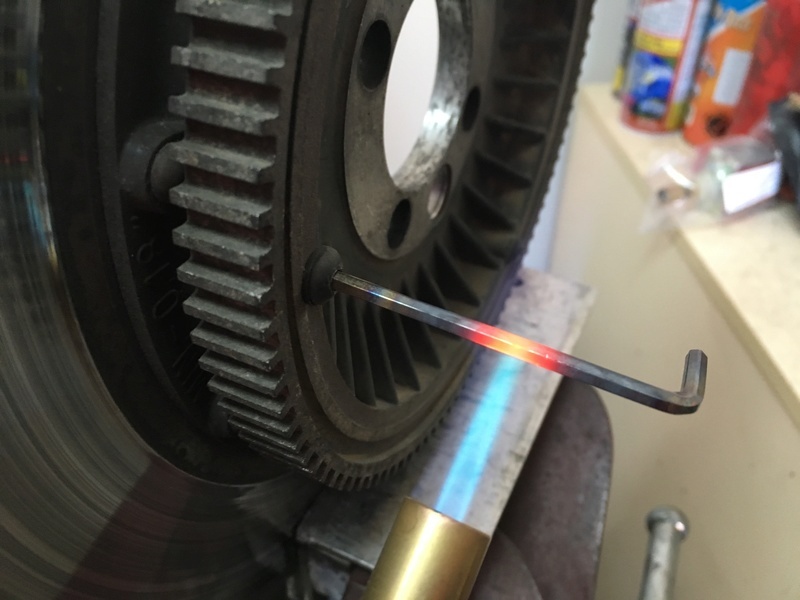 Using your method, the heat is all transferring by conduction through the sacrificial tool and then radiates out through the bolt threads. This puts the heat exactly where you want it to attack that pesky thread sealant and not (wasted) heating up the whole rotor, disc etc. I look forward to trying it in practice. The screws on the ABS ring are just half the battle. The next challenge is working around the ring to slowly back it off. This is an 'ossum' tip as I have a perfectly usable rear disc with a stubborn and unneeded ABS ring attached. I will try it and report back. Ta. Yes you're right Duck, the ring is as big a challenge if not more so than the button head retaining screws. When I took the ABS rings off my now ABS-less K75 wheels I used delicate tools like a big screwdriver that has the steel shank all the way through the handle and a hammer. My plan was to use the tip of the screwdriver as a wedge between the back of the ring and the hemispherical heads of the disk rivets. I clamped the rotor as in the photos above and applied quite a bit of heat all the way around the ring but not enough to colour the steel of the ring. The whole assembly heats up fairly quickly so I then applied a wet cloth to the aluminium carrier hoping that the aluminium would contract quicker than the steel ring. So the process went, heat up, apply cooling to the carrier and quickly drive the screwdriver tip between ring and rivet head. Repeat .......Repeat. After a couple of cycles I could see some tiny movement so I rotated the assembly so as to only work on the segment closest to the vise clamping jaws. I didn't count how many times I had to do this but it slowly but surely came off (didn't have time to take photos in amongst those actions). Close inspection of ring and rivet heads after separation showed very minimal bruising. Those rivet heads are as hard as. No damage to the tooth area of the rings and very faint marking on the inner circumference edge which was easily cleaned up with a fine file. On the K75 the rings were not going back on. On my K1100 I'm like Olaf and have a new rear disk to fit so will have to change over the ring - haven't worked up the courage yet but I'm sure it will involve putting the disk in the freezer and the ring in the oven. If you're de-ABSing a bike then I thinks it's best just to leave the ABS ring on the rotor. All it is is a little extra weight, and not much at that. @duck wrote: If you're de-ABSing a bike then I thinks it's best just to leave the ABS ring on the rotor. All it is is a little extra weight, and not much at that. That's what I did. You can't really see it on the rear wheel like you can on the front. Just remove the ABS pickup and it's bracket.